Cyberpunk 2077 recently got a 48-minute long gameplay demo, and it appears we keep getting drip fed more and more information each day. CD Projekt Red has been responding to player questions on numerous channel. 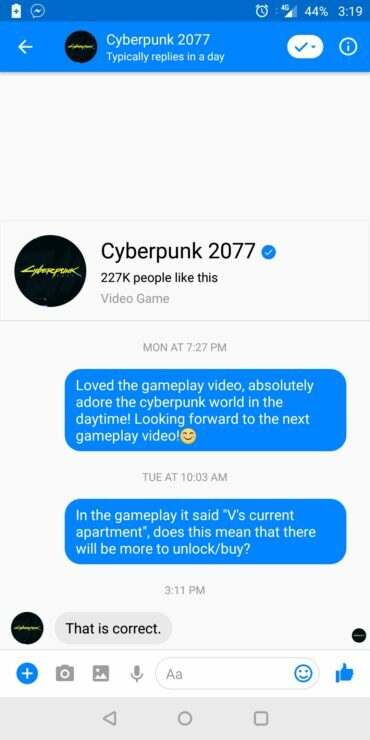 One player managed to speak to the developers via Facebook messenger, it has now been confirmed players will have the ability to purchase apartments. CD Projekt RED’s official forum also confirmed there would be no companion system unless missions call for it.